Some people wax rhapsodic about the joys of checking their suitcase and only traveling through the airport with a small personal bag or briefcase. While we’re not always big fans of letting someone else take our suitcase, we can see some of the benefits of checking your bag before your flight. 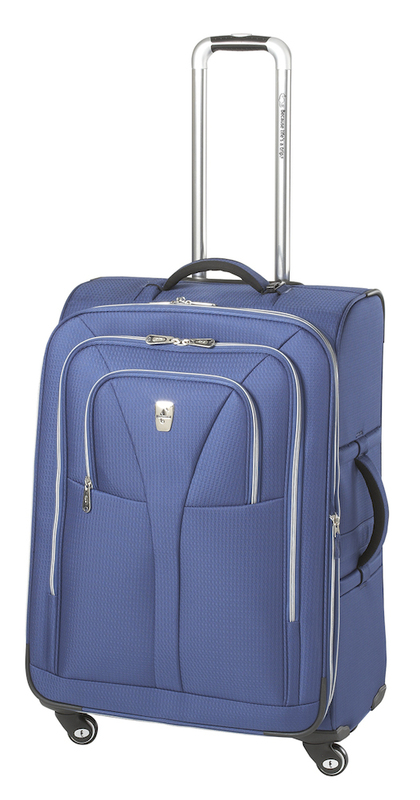 You’d need to check this Atlantic 25 inch Compass Spinner suitcase. 1. You can take everything you want and have options for clothes and souvenirs. If you’re taking an extra long trip, and you don’t want to wear the same pants five times, the big suitcase makes sense. It also leaves you plenty of room to pack souvenirs on the way home. 2. Once you check your bag, you’re FREE! No more wrestling your bag in the bathroom, or worrying somebody will shout “Abandoned bag! Abandoned bag!” when you step away to throw something in the trash can. 3. Security is a breeze. Other than your personal bag, you don’t have to have anything examined. No 3-1-1 bags, no leaving personal toiletry items at home, no packing tiny toiletries. 4. You can walk through the airport hands-free. You can get a latte or a lunch, and not have to try to keep track of your bag. You don’t have to keep reaching out to make sure the bag is still under the table or next to your chair. 5. You don’t have to worry about whether there will be overhead bin space. As long as your personal bag will fit under the seat in front of you, this isn’t even an issue. This means you can take your time getting on the plane, and spend a few extra glorious minutes not being crammed into your seat. What about you, suitcase travelers? What are some of the reasons you’re skipping the carry-on and going straight for the big bag? Let us hear from you in the comments section below or on our Facebook page.